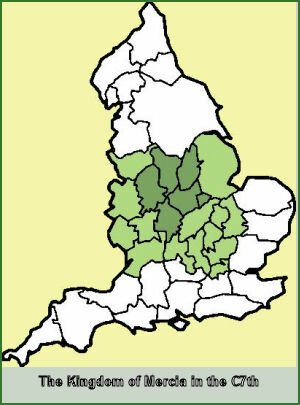 In Anglo-Saxon times Cheshire, Derbyshire and Lancashire formed part of the tribal kingdom of Mercia. Which name derived from the Old English word 'Mierce' meaning border people. Mercia was settled by Angles in around 500A.D. The kingdom at first consisted of the border areas (modern Staffordshire, Derbyshire, Nottinghamshire, and northern West Midlands and Warwickshire) that lay between the districts of Anglo-Saxon settlement and the Celts or Wealas (meaning foreigners) , as the Welsh were known to the Anglo-Saxons, It later covered the Hwicce territory (the rest of West Midlands and Warwickshire, eastern Hereford and Worcester, and Gloucestershire) and spread also into what was later Cheshire, Salop, and western Hereford and Worcester. The Battle of Feathanleag which took place around 584 A.D is believed to have been fought in the area of Faddiley in Cheshire . A Celtic British force led by Brochwel, Prince of Powys defeated the army of Ceawlin, King of the West Saxons (died circa 593), one of the key figures in the Anglo-Saxon conquest of England, who was attempting to advance into Wales. The Anglo-Saxon Chronicle records the event '"This year Ceawlin and Cutha fought against the Britons at the place called Fethan-lea, and there was Cutha slain; and Ceawlin took many towns, and spoils innumerable; and wrathful he thence returned to his own." The battle took place either on the flat ground by Woodhey Hall, or lower down the hill by the Thatch Inn, where the defending force would have the advantage of broken ground protecting its flanks. The earliest king of Mercia of whom anything is known was the warlord Creoda, who rose to power in about 584, he is recorded as having been the son of Cynewald, the grandson of Cnebba, and the great-grandson of Icel, consequently, members of the Mercian royal line were known as Iclingas. Creoda built a fortress at Tamworth (modern Staffordshire) which became the seat of the Mercian kings. Penda (died 655), took over the Severn Valley in 628 following the Battle of Cirencester and defeated Edwin, King of Northumbria at the Battle of Hatfield Chase in 633. He defeated and killed Edwin's eventual successor, Oswald, at the Battle of Maserfield, laying the foundations for the Mercian supremacy over the other Anglo-Saxon kingdoms. Thirteen years later, Penda was soundly defeated by Oswald's successor Oswy and was killed at the Battle of the Winwaed. Mercia was converted to Christianity in the latter part of the seventh century, much later than other Anglo-Saxon kingdoms of England, when Oswy of Northumbria supported Penda as king of Mercia, a condition of this support was that his son was to marry Oswy's daughter, Alchflaed, and to convert to her religion. Legend relates that King Penda of Mercia arranged the marriage of his son Paeda to the Lady Alchflaed, the daughter of the Christian King Oswy of Northumbria. Penda accordingly allowed four Christian priests, Cedda, Adda, Betti and Diuma, to accompany his son on his return to Mercia. As a term of the union with his daughter, King Oswy insisted that Paeda take the Christian faith and he was baptised. There remains doubt as to when the crosses were actually erected. There are claims that it was during the lifetime of Paeda, although others argue it was later. The crosses are lavishly carved with animals, vine scrolls and Biblical scenes which include the Nativity of Christ and the Crucifixion. They were originally painted as well as carved, they are among the finest surviving examples of Anglo-Saxon high crosses. Further fragments of Anglo-Saxon cross shafts and tomb slabs, which once stood in the market place at Sandbach, can now be seen in the nearby churchyard of St. Mary's Church. The Clulow Anglo-Saxon Cross, which dates from the ninth century, stands in a patch of woodland to the north of the village of Wincle (OS grid reference- SJ952674), Nothing is known of its origin or purpose, but it may have been a boundary marker. The broken millstone grit pillar stands about 10 feet high on a large conical mound, measuring 250 feet in diameter and 25 feet high. A further Saxon Cross can be found in the churchyard of St. Peter's Church at Prestbury. The cross was found embedded in the walls of the chancel in 1840, where it had lay hidden for centuries. 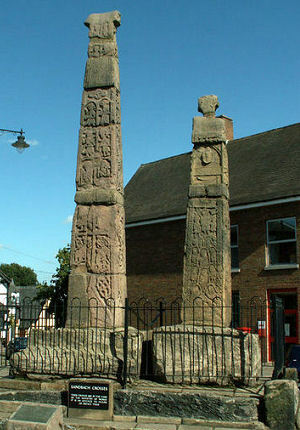 An Anglo-Saxon stone cross (10th century) was found near Cheadle in the 1870s. The cross is now located in the parish church of St Mary in Cheadle. 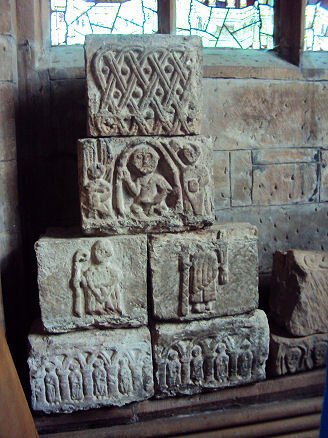 Saxon carved stones were discovered incorporated into its foundations of St Mary's Church at Acton, near Nantwich during a restoration of the building in 1897, these stones (pictured left) are now on display in the church. The remains of a further Saxon cross, found in 1841 built into the church wall, can be seen in the churchyard of St. Peters' church in Prestbury. The three fragments of crosses found are now cemented together. Perhaps the best known Mercian ruler was Offa, son of Thingfrith (died 796), who rose to power during a civil war to become the greatest of Mercian kings, following the murder of his cousin, King Aethelbald, by Beornraed. After spending fourteen years in consolidating and ordering his territories he engaged in conquests which were to eventually make him the most powerful king in England. After a successful campaign against the Hestingi, he defeated the men of Kent at Otford (776), the West Saxons at Bensington in Oxfordshire (779), and finally the Welsh, depriving the last-named of a large part of Powys. He is most famous for constructing Offa's Dyke, marking the border between Wales and Mercia, which is mentioned by the monk Asser in his biography of Alfred the Great: "a certain vigorous king called Offa...had a great dyke built between Wales and Mercia from sea to sea". Forming the traditional boundary between England and Wales. This impressive earthwork runs, although not continuously, from the Dee estuary in the north to the river Wye in the south. Offa proved to be a formidable ruler. As King of Mercia, he exercised considerable influence over Wessex and Northumbria. He was a contemporary of the great Frankish king Charlemagne and sought to stand up to him as an equal. His son, Ecgfrith, reigned for only 141 days, he was most likely killed by Offa's opponents. Ethelred, Ealdorman of Mercia, married his kinswoman, Aethelflaed (869 / 870–918), the eldest daughter of Alfred the Great and Ealhswith, daughter of Ethelred Mucel, Alderman of the Hwicce, who's wife was a descendant of Penda of Mercia. She joined her husband in resisting the invasions of the Vikings. Ethelred was killed in battle in 911, whereupon Aethelflaed became the effective ruler of Mercia the Anglo-Saxon Chronicle styles her as the 'Lady of the Mercians' (Myrcna hlæfdige). Aethelflaed built the new Saxon 'burh' of Chester. Bonewaldesthorne's Tower, on the Chester city walls, is rumoured to have been so named after an officer in her army. She rebuilt Chester's walls in around 907 A.D. extending them to the edge of the river on the South and Western sides of the old Roman fortress, to establish Chester at the centre of a line of burghs, stretching from Rhuddlan in North Wales to Manchester, to protect the northern frontier of Mercia. Aethelflaed allied herself her brother Edward the Elder against the Vikings. She fostered Edward's son, Athelstan and worked towards his eventually gaining the English crown. She captured Derby from the Vikings and defeated them at Leicester. She had received an agreement from the citizens of York to take the city and was on her way to York but died at Tamworth in 918 before the campaign was completed. She was buried byher husband, Ethelred, at St Peter's Church (now St Oswald's priory) in Gloucester alongside the bones of St Oswald a former Christian king of Northumbria. Mercia was inherited by Ethelred and Aethelflaed's daughter, Aelfwynn, born before 903. Aelfwynn submitted to her uncle, King Edward the Elder (reigned 899-924), who took her captive, after which Mercia was annexed to Wessex and thus Edward solidified his control over most of England. Aethelflaeda's descendants continued to occupy the English throne. Aelfwynn's daughter, Aethelfleda Eneda married her cousin King Edgar 'the Peaceful', who later deserted her and married his mistress Elfrida. Aethelflaeda of Mercia's great-grandson, Edward the Martyr, the son of Aethelflaeda and Edgar was murdered in 978 by his step-mother, Elfrida, so that her own son by Edgar, known to history as Ethelred the Redeless could ascend the English throne. Mercian place names can be seen throughout the county of Cheshire. They can be recognised by the suffix 'ham', deriving from the Saxon word 'hamm' meaning a settlement, examples are Frodsham, Eastham and Weaverham; and the Saxon 'burgh' or 'bury', meaning a fortified settlement or stronghold, such as Astbury, Wrenbury, Bunbury and Prestbury.The Anglo-Saxon suffix wic signifies a dwelling place or fortified place, as in Nantwich, Northwich and Middlewich. Traces of an Anglo-Saxon long-house survive close to the Old Dall at Tatton Park. It has been suggested that the name 'Tatton' is derived from 'Tatters Tun', the Anglo-Saxon for the town or village or ' tun' belonging to 'Tatter'. St. Plegmund's Well, one of only two holy wells in west Cheshire, is situated close to St Peter's Church, Plemstall, near the village of Mickle Trafford, about two miles to the east of Chester. The well is named after Plegmund, a 9th century Archbishop of Canterbury, who prior to becoming an archbishop is reputed to have lived a hermit life in Plemstall and to have baptised people who visited his cell at the well. As Archbishop Plegmund crowned King Edward the Elder. The Staffordshire Hoard is the largest hoard of Anglo-Saxon gold and silver metalwork ever found to date. It was unearthed in a field near Lichfield, in Staffordshire on 5th July 2009, the huge hoard consists of over 3,500 items and is far larger than the Sutton Hoo discovery in 1939 when 1.5kg of Anglo-Saxon gold was found near Woodbridge in Suffolk. The artefacts were discovered in what was the heartland of the Anglo-Saxon kingdom of Mercia which was militarily aggressive and expansionist during the seventh century under kings Penda, Wulfhere and Ethelred. Most of the items in the hoard are military, like a collection of trophies, but it is not possible to say if the hoard was the spoils from a single battle or a long and highly successful military career. The superb quality of the craftsmanship on many items indicates royal ownership.